It’s royal Ascot with a difference on Friday as prolific Fylde coast jockey Maurice McCarthy bids to raise £5,000 or more for charity at the iconic racecourse. Ascot stages its charity race for the Prince’s Countryside Fund in front of the watching Prince of Wales and Duchess of Cornwall on Friday afternoon, when McCarthy will be contesting his 40th charity race. Poulton-based Maurice will be riding the favourite Scrutinise but his top target will be to raise as much money as possible for a cause close to the heart of Prince Charles – the Prince’s Countryside Fund provides £1m in grants each year for projects in rural communities around the UK. .
Maurice only took up jockeying at the age of 36 and has never ridden professionally. After a couple of races as an amateur, he has concentrated purely on charity racing for the past 15 years. He has so far raised £166,000, which is believed to be a world record. Maurice competed in this event last year and this will be his fifth race at Ascot. He has never ridden Scrutinise before, having been granted use of the six-year-old gelding, a three-time winner, by its owners and trainer. Maurice hopes that with Scrutinise’s help he will accept the trophy from Prince Charles and raise a princely sum. Maurice was a sporting all-rounder before turning his attentions to jockeying. He represented Blackpool at both codes of rugby and had trails at Nottingham Forest under Brian Clough. He told The Gazette: “I was always interested in horseracing and decided I’d try it. 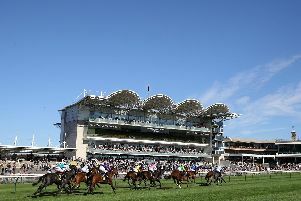 The Prince’s Countryside Fund Charity Race is run over seven furlongs and starts at 12.15pm.